Focus on your core business and what makes your application unique. Stop building expensive and complicated infrastructure. Superfeedr does the heavy lifting. Give Superfeedr your feed URLs, and all new content will be pushed to you immediately. 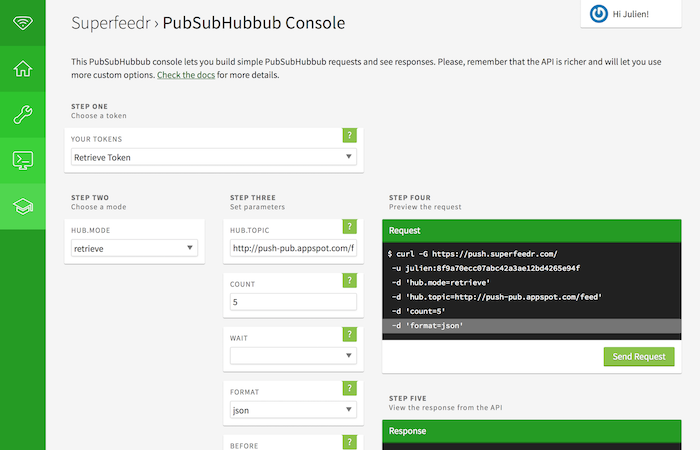 We use PubSubHubbub (webhooks) to get everything to you instantly. Superfeedr sends data strictly in Atom or JSON - regardless of the format of the original feed. We can all do without the headache of handling millions of formats! If you receive less than 10,000 notifications per month, using the Superfeedr feed API is totally free. If you receive more than that, we'll match or beat the cost of your existing system. You can check out our pricing to get an estimate of what your monthly costs would be. Polling is expensive and wasteful. We use PubSubHubbub, RSSCloud, and more to help us find updates instantly. Superfeedr also host a very big XML-RPC ping server, so we can collect new data as fast as possible. Superfeedr still polls the feeds, up to every minute for high-frequency feeds – and our RSS parser is specifically looking for updated content. We built Superfeedr on cloud infrastructure. This means that as demand for Superfeedr's service increases, our technology will scale accordingly – continuing to provide you with stellar service. Superfeedr is a large part of the technology that powers the popular Feed Channel on IFTTT, helping us reliably deliver in real-time millions of entries a day. Our API console makes it easy to visually create and execute requests without leaving your browser. Perfect for quick tests and fast learning. 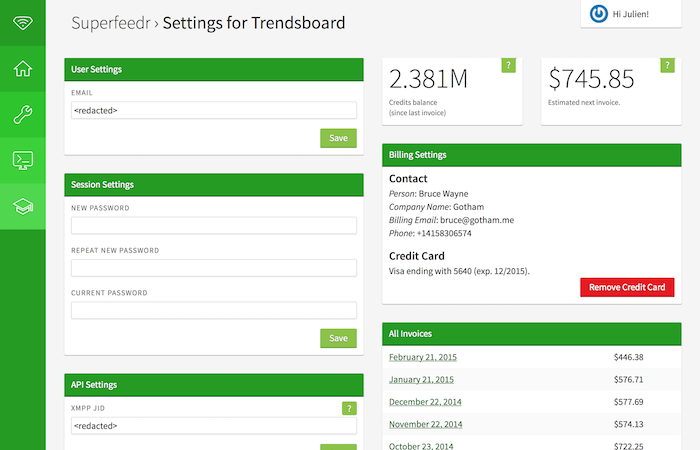 The account dashboard makes it easy to see your credit consumption, manage billing, and review past invoices. 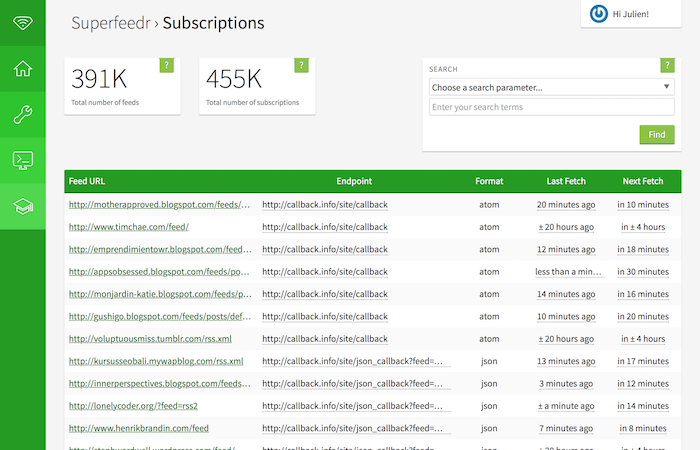 The subscriptions table gives you a birds' eye view of everything you're subscribing to. See your callback endpoints, feed formats, and more. Plus, it's easy to filter and search, so you only see the feeds you want. 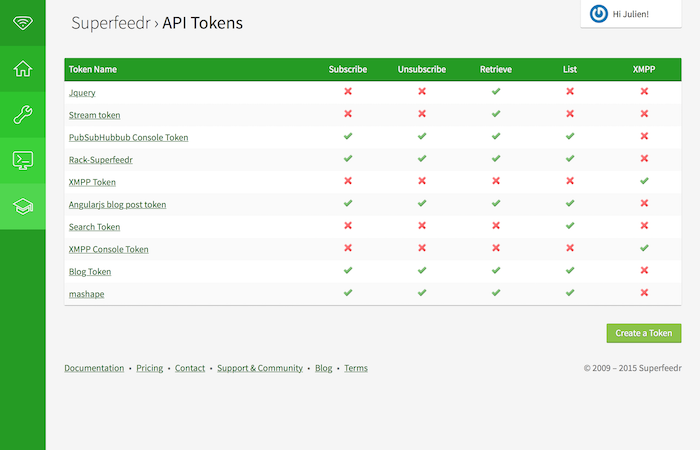 Easily provision access to your account with Superfeedr API tokens. Create tokens for different parts of your app with granular control over permissions. Couldn't be easier. [Superfeedr provides] centralized and normalized data and error reporting. [It] lets us focus on our core product vision and not the day-to-day feed updates. Superfeedr’s pricing is simple: You only pay for what you use. And if you subscribed to less than 10 feeds in the month, your bill is on the house. Subscribe to as many feeds as you need. Every 30 days, we look at the maximum number of feeds to which you subscribed since the last invoice and we’ll bill you according to the table on the right. In fact, the more feeds you subscribed to, the cheaper Superfeedr becomes. * Contact us for very high volume account discounts.